Please note that I put “accessible” in quotes. I fully realize that this shower is not accessible to anyone who can’t walk; however the innkeepers are advertising it as “wheelchair accessible”. And unfortunately that is very misleading. So in an effort to make lemonade out of these inaccessible lemons, I’m turning this debacle into a PSA – for both innkeepers and travelers. 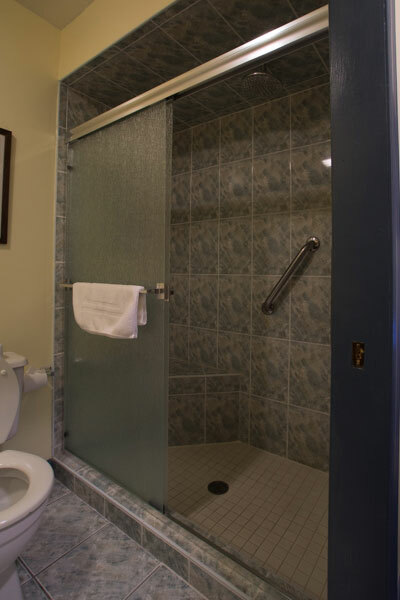 For innkeepers, here are a few reasons why you can’t call your low-step showers “wheelchair-accessible”. And for travelers, here are a few things to look out for when an innkeeper says they have a “walk-in” or “low-step” shower – both of which are not accessible, or even “ADA compliant” (as some innkeepers claim). So here we go… What’s Wrong with this “Accessible” Shower? 1. There is a four-inch lip at the threshold. It is not something that a full-time wheelchair-user can navigate. And even if they did have assistance (and some upper body strength) there is no room for an attendant to help them bump up over the threshold. It may as well be Mt. Everest. 2. The grab bars are located hear the shower controls, not the built-in seat. Even if this was a roll-in shower with no lips or obstructions, the grab bars (as placed) would be useless for transfers. The only thing these grab bars are good for are for is steadying yourself as you walk into the shower. Granted, that’s good for safety, but useless for wheelchair-users. 3. The built-in shower bench is not located near the shower controls. You can’t assume someone can just walk over to the controls to operate them. They have to be operable from a seated position, because most wheelchair-users can’t get up to use them. 4. Although a transfer might be possible from the part of the shower near the shower bench (if grab bars were properly installed) it’s downright impossible in this instance, as the toilet was installed directly in front of the back portion of the shower door. In order for a wheelchair-user to transfer, they have to be able to roll up to the shower (either parallel or perpendicular). This would be a difficult/impossible transfer even if the toilet wasn’t there, because the shower bench is placed diagonally. A better placement would have been straight across the depth of the shower. 5. You can’t see it, but the shower controls are a good four-feet high, and not reachable from a seated position on the built-in bench. 6. The soap dish is five-feet high, and next to the controls. It’s totally useless for anybody who is seated. 7. There is no hand-held shower head. The European style rainfall shower is located close to the controls, and if you are sitting on the bench, you don’t even get a trickle of water. As you can see, this design is not at all useable for most wheelchair-users. So, innkeepers – think about this when you install your accessible showers. Take a regular chair and sit it next to the shower, and then try and get into the shower, without walking or using your feet. If you can’t do it, then it’s probably not accessible to full-time wheelchair-users. And travelers – buyer beware. Ask a lot of questions when an innkeeper mentions a “walk-in” or “low-step” shower. Don’t be afraid to ask for measurements, grab bar positions and even pictures. After all, you are paying for the room, and you should be able to access all of the facilities. In short, beware the “walk-in” shower. It is NOT accessible. So Where Do they Want Me to Put It? This entry was posted in Editorial, Lodging, Road Trips and tagged accessible, ADA shower, bathrooms, hotels, inns, travel, walk-in shower, wheelchair, wheelchair-users by Candy B. Harrington. Bookmark the permalink.